Southeast Asia has received a lot of coverage in the Canadian metropolitan media over the past few months. The focus has been the systemic violence against the Rohingya people in Myanmar. Some media have also reported instances of earthquakes, flooding, landslides and storms in Myanmar, the Philippines, Thailand and Vietnam that have displaced thousands and killed many people. This news of despair is nonetheless news from the once little-known region of Southeast Asia. Many Canadian students are still struck by the fact that when measured by population, Indonesia is the fourth largest country in the world, just slightly below Canada’s neighbour, the United States. We still can’t expect an upsurge of news about Southeast Asia in the Canadian media but we can expect the Canadian government to do more to nurture the Canada-ASEAN partnership that was formalized in 1977. We can perhaps expect more investment from Canadian government in higher education in both Canada and Southeast Asia to cultivate a new generation of Canadians and Southeast Asians who will be more prepared to work together to face the challenges of our time. In this context we are pleased to hear that Canada will provide “$10 million over five years for post-secondary students and mid-career professionals from Southeast Asia to access world-class education in Canada” (see Announcement from Global Affairs Canada in this issue). Such a decision, we believe, is due in no small measure to the new sense of geopolitical time and space as Canada reconfigures its place in the changing (Asian) world. It is perhaps also due to an increasing awareness of the importance of knowledge exchange and research as a basis for making policy. We saw such orientation in a conference organized by Global Affairs Canada on 30 May 2017 titled: “Southeast Asia in an Evolving Global Landscape: Prospects for an Integrated Region and Implications for Canada.” Ambassadors from ASEAN countries, members of academia and non-governmental research and advocacy organizations attended the event. In some ways, our 33rd CCSEAS Conference is acknowledging the importance of the Canada-ASEAN partnership and registering a hope that inter-governmental relations will open more spaces for education and research in academia in both Canada and Southeast Asia. We will open our conference, which starts on 26 October, with a special roundtable discussion titled: “Canada and ASEAN at 50: Common Fears and Common Hopes.” The panelists include Ambassadors from Indonesia and the Philippines, representatives from Global Affairs Canada and Canada-ASEAN business councils as well as members of academia. Dr. Trimillos’ keynote also serves as an introduction to “Luzviminda: The Philippines Dances for Canada 150” directed by R. Patrick Alcedo. The concert is part of a series of cultural performances at the conference that includes traditional Vietnamese music, “The Sound of ASEAN-Canada” under the direction of Kathleen Tu Ngo Thanh and Indonesian “Kayonan Gamelan – traditional Balinese Music and Dance” to be led by Keiko Ninomiya. Featuring Southeast Asian cultural performances is a way for us to respect the tremendous contributions made by Southeast Asian Canadians to Canada. We thank the Indonesian and the Philippines Embassies and Consulates, the Canada-Vietnam Society, the International Development Research Centre-University of British Columbia’s Myanmar Project, York University’s Office of the Vice-President, Research & Innovation, and the Asia Institute at the University of Toronto for their financial support. We thank those who have helped us in organizing this event as well as our hosts, the York Centre for Asian Research at York University. We particularly appreciate the student representatives of the CCSEAS Committee, Kilim Park (University of British Columbia), Nhu Truong (McGill University), and Jean-François Rancourt (Université de Montréal) who made the CCSEAS 2017 Newsletters possible (see their remarks in this newsletter). It costs nothing to imagine… But for now, what is real is that we are together here to celebrate CCSEAS and Canada-ASEAN. Let’s enjoy this 2017 conference. We look forward to seeing each of you at York University! This essay discusses findings from my fieldwork conducted in April 2017 in Kandal village, Banteay Meanchey province, Cambodia. Banteay Meachey province is in northwest Cambodia and Kandal village is near the Thai-Cambodian border. Many people from Kandal village have migrated to Thailand for work as a livelihood strategy since agricultural crops are expected to take a plunge in price. For this reason, the influx of international remittances into the village is becoming a remarkable phenomenon which contributes to an emergence of rurbanization. The term “rurbanization” was originally coined by Talcott Parsons (1949) to define a process in which the lifestyle in rural communities comes to resemble that of urban towns, for example, the emergence of mechanization amongst rural farming communities in the United States. In migration studies, rurbanization describes the development of sending communities through migrant workers’ remittances in material and non-material dimensions. Because of remittances, the life and development of the sending communities may gradually resemble those of cities, exemplified by modern buildings (Alexandru 2012). Monica Alexandru (2012) adopted the concept of rurbanization to study migration and social mobility in Europe. According to her research, Romanian migrant workers who had been working in urban Italy built new Italian-styled holiday houses in their rural villages of origin. The emergence of these Italian houses benefited the local construction industry, which indirectly made the village prosperous and economically stable, partly due to more job vacancies. Additionally, returnees from Italy used their acquired skills such as hairdressing to make money for their education. Therefore, Alexandru’s study has shown that migrant workers’ remittances can make material and non-material contributions to their hometown. My field study conducted in Kandal village, like Alexandru’s study, also points to the migrant workers’ material and non-material contributions to their home community. An interviewee, whose two brothers were working in Thailand, told me that many houses in Kandal village were built with migrant workers’ remittances (see figure 1). Another interviewee said the same thing that they used the money remitted by their relatives working in Thailand to build houses and buy motorbikes (see figure 2). New houses have resulted in better living conditions for local people and motorbikes have helped them travel easily. Material items have satisfied the local people’s non-material needs. Beyond individual households, economic improvement is extended to public infrastructure and community spaces such as a shrine and monastery to which, for the sake of merit making, migrants in Thailand make donations. Migrants have also contributed to the building of new crematoriums. Interestingly, my field study has found that non-material contributions have caused a cultural collision. Local teenagers drive their motorbikes very fast and pay little attention to pedestrians’ safety; this has caused complaints from the elderly and the number of road accidents in Kandal village has increased rapidly. What is more, these teenagers have formed a motorbike gang. An interviewee told me that many of these young motorbike riders were migrant workers in Thailand and they just copied the Thai gangsters’ behaviour. Before, streets in Kandal village were quiet and had few accidents, but non-material contributions have changed local life and angered the older generation. Also, I observed that in fear of road accidents and fast-riding gangs, some parents did not allow their children working as migrant workers to travel long distances to return home. Some parents said that they even preferred their children to stay in Thailand rather than to visiting their home towns due to safety concerns over road accidents. The purpose of this research project is to deepen our understanding of rurbanization through exploring the cultural collision between the non-material contributions and the local traditional lifestyle, and the outcome will make an important contribution to learning more about migrants in Cambodia’s Banteay Meachey province. Alexandru, Monica. (2012) “Stories of Upward Social Mobility and Migration in One Romanian Commune: On The Emergence of “Rurban” Spaces in Migration Sending Communities”, Eastern Journal of European Studies 3 (2): 141-160. Parsons, Talcott. (1949) Essays in Sociological Theory (revised edition), New York, Collier-Macmillan Limited/ London: The Free Press. Veng Seang Hai is an MA student in development studies at Chiang Mai University. In 2012, the United Nations (UN) Secretary General called upon all UN agencies to help develop a focus on fostering positive youth policies, especially those that could help stimulate growth that is linked to decent work and job creation. This call for a youth-centred approach came about at a time of crisis when youth unemployment in many countries of the majority world were often several orders higher than non-youth. Though the numbers may have improved in much of the world since the last global financial crisis, there is still much that can be done for youth-responsive policy making. With this in mind, my present research as an IDRC Research Award Recipient is trying to understand the ways in which economic and development policies incorporate youth job aspirations in the ASEAN (Association of Southeast Asian Nations) region. Job creation in the ASEAN region has greatly focused on developing manufacturing and processing industries that are linked with global value chains and regional networks (transport, communication, labour flows, etc). It is unclear how these policies affect the job aspirations of young women and men and whether they result in an overall increase in well-being. If not, then policymakers should be asking who benefits most from development interventions and what changes need to be made so that the most marginalized and the most vulnerable stand to benefit the most. As part of this research, I travelled to Myanmar and Vietnam to speak with some young people and organizations working with youth. The scoping trip to Dawei in Myanmar and Quy Nhon in Vietnam was a success in that it gave me a clearer idea of what the issues are and what the research should focus on. Dawei and Quy Nhon are medium-sized cities that are important urban centres in their respective provinces, having a concentration of institutions (provincial administration and universities) as well as a concentration of industries and port activities. They are actually on the opposite ends of the Southeast Asian peninsula and connected by a regional road that crosses from the South China Sea to the Andaman Sea. After upgrades to the western-most section from Bangkok to Dawei, the road is expected to be a major route for cross country trade. Around half of the world’s urban population live in cities that contain less than 500,000 people, a convincing statistic that justifies the choice of looking at these smaller cities in Vietnam and Myanmar. In Dawei, a large Special Economic Zone (SEZ) has been slowly materializing along the Andaman Sea. Many of the villages surrounding the zone reported that only a fraction (some say only 15 per cent) of their youth remain in the village, as the majority of working age youth are working or studying in Thailand or elsewhere. Local support seems to have been strongly influenced by the belief that it will provide employment opportunities that will draw young Myanmar people back to their country. Some local organizations, however, are concerned that traditional fishing livelihoods are at risk. Over 2000 small-scale fishing vessels are registered in the villages surrounding the Special Economic Zone, and I spoke with a few organizations that are afraid that the container ship traffic accommodated by the two deep sea docks will endanger traditional fishing. Dawei is home to some light manufacturing that could benefit from the regional integration expected with the new road upgrades. I visited a cashew processing factory as well as a small-scale fish cracker factory where many of the workers were young women. They were working hard cracking the blackened cashew shells while some had left their children to play in the pile of unprocessed nuts. My time in Quy Nhon also revealed some interesting highlights. A large peninsula once covered with sand dunes and bushes has been slowly converted to zones with industrial processing, tourism, luxury housing and a large resort with an adjacent golf course and safari. A look at Google Earth gives one a great impression of the vastness of the conversion. My first reaction was one of astounding hesitation — I asked myself if this kind of economic development is truly what can help low-skilled and vulnerable youth find meaningful work. However, while sitting at a tea stall nearby the resort, some of the patrons had a positive outlook. They told me that previous to the construction of the resort, many of the working age women and men left the village (and often the country) to work. Some of the locals said that now they can find work in landscaping, grounds keeping and housekeeping. The next step of my research is to speak more in-depth with young Vietnamese and Myanmar people through focus-group discussions and life-histories. I am particularly interested in finding out how new economic opportunities may or may not fulfill their aspirations for a good job and a good life. Understanding the livelihood aspirations of young women and men can help influence policies that are youth friendly and help better fit young job seekers with adequate and decent work. Jonathan De Luca is an IDRC Research Award Recipient in the Employment and Growth program and holds a Master’s degree from York University. Last year, I was living and working in Bangkok as well as was conducting interviews with organizations implicated in the 2015 Thai Fisheries Reform for my master’s thesis. Thanks to the threat of economic sanction from the European Union and international media coverage of slavery scandals at sea, the Thai government had embarked on an ambitious overhaul of its previously basically non-existent fisheries management regime. The aim was twofold. The first was to address and eliminate illegal, unreported and unregulated fishing (IUU), which was said to be incentivizing criminal activity and with negative economic and environmental repercussions. The second was to eliminate labour abuse in the fishing sector, which had garnered a notorious reputation for being rife with human trafficking. I was there in the heat of the reform while many policy changes were (and continue to be) implemented. Surprisingly, many organizations were open to speaking about their experiences. One of the organizations I had kept in regular touch with was the Issara Institute, a prominent fishers and migrants rights non-governmental organization (NGO) in Thailand. The organization asked if I would like to travel to Yangon to interview some of the rescued trafficked fishers they had been assisting. I was taken back by their request to interview migrant fishers. I wasn’t a social worker, how could I help? But the NGO said that the men felt unheard; they rarely spoke about their experiences. Writing a research brief from the men’s experiences post-rescue would not only contribute to the literature but allow the men to voice what they were going through, if that’s what they felt like doing. And so with the support of Issara and Dr. Melissa Marschke (University of Ottawa), I wrote the research plan, prepped the ethics form, hired a skilled translator, and travelled to Yangon. All the while, questions flew around my head. I was both excited and nervous. The research opportunity was enormous, but I questioned who would be benefitting more: me or the men? How could I do their stories justice and make them feel heard? Over the course of that week, I interviewed thirteen men. Dr. Marschke, co-author of the research brief, interviewed two more on a separate field trip. Some men spoke very matter-of-factly about their experiences, others did not go into detail. Others, meanwhile, felt very passionate about sharing their complete story, from the moment they were trafficked to their struggles back home. It was an incredibly humbling experience. They displayed incredible resilience. The men had suffered some combination of violence, deception, and separation from family, of differing severity. While each experience was unique, they all had not been compensated for their years in exploitative labour. From the academic perspective, I learned about the struggles of navigating assistance provision and reintegrating into society, and how assistance isn’t really equipped to provide the men what they need most: re-employment opportunities and salary restitution. All the men came because they trusted the NGO, but the remarks about Chaw Chaw came mostly from the most hard-hit of the men; those that were orphans, without families, or who had been in forced labour for the longest times. Chaw Chaw knew these men were especially vulnerable, and helped them above and beyond her 9 to 5 job. Their admiration and love for Chaw Chaw was inspiring, and I realized that I too needed to trust Chaw Chaw. I knew from my field experiences over the past dix months that that from working in the past six months in the field that NGOs working with vulnerable groups rarely granted access to interviewees unless they think it is safe and beneficial for both the NGO and the participants; this meant that they also trusted me. If Issara thought these interviews would be beneficial to the men, then I had to trust in them and trust in myself. All the men want is for people to know what happened to them, and to recognize the injustice. Now that I am back in Canada, I will do my best by sharing the stories of the men in forums such as these. The Issara Institute actually went back six months after my field work to do follow up interviews with the men, which they greatly appreciated. Issara will also publish the research brief in Burmese, so that for once, they and their families can actually access it and it’s not only for the eyes of Western donors. All of these efforts, while they may seem minute, work towards the very important task of supporting and empowering migrants workers. NGOs play an extremely important role in migrant issues in Thailand. In the case of fisheries, they provide direct assistance to those who need it most. Where the government and international organizations let individuals slip through the cracks (and sometimes they are very big cracks), NGOs do their best to be the safety net. That’s not to say all NGOs are perfect (just read the resulting brief search brief), but assistance for migrants, especially repatriated trafficking victims, remains weak. NGOs are doing their best at filling a void in which government services, or at least more collaboration, should exist. Don’t get me wrong – NGOs can get sucked into funding battles, wastefulness, and drama. People and organizations at all levels can fall into the same traps; the researcher that is just happy to get their data, for example, or the international organization that can’t wait to write a heart-wrenching story out of this. But we need to remember that our motivations for interacting with vulnerable groups and the way we do it matters. It matters for human dignity and respect. After all, what matters is not only that the people working with vulnerable groups are skilled, but that they are also people who truly care. To see the impact Chaw Chaw had on the lives of the men I interviewed was extremely touching, especially after all the hardship they went though. At the end of the day, I realized I was simply an extension of the strong trust between Issara and the men they were assisting. Olivia Tran is a Master’s Candidate at the University of Ottawa at the School of International Development and Globalization. With the support of the New Directions in Environmental Governance (NDEG) project, she wrote her thesis on Thailand’s fisheries reform and the impact on migrant workers. Je travaille sur la pratique du journalisme à Singapour. C’est à l’été 2017 que j’ai entrepris un travail de terrain au sein de la cité-État, durant lequel je suis allée à la rencontre de journalistes oeuvrant pour des médias écrits traditionnels. J’étais très intriguée par la conception que les journalistes singapouriens ont de leur travail, alors que ce dernier est restreint par un ensemble de mesures formelles comme moins formelles. En effet, bien que la liberté d’expression soit garantie dans la constitution du pays (article 14), nombreux sont les mécanismes et règlements rendant le respect de cette garantie aléatoire. Pour ne nommer que ces exemples, parler d’homosexualité peut être considéré par les autorités comme une « promotion de modes de vie alternatifs », et recenser des tensions entre groupes ethniques ou religieux une atteinte à la promotion du multiculturalisme. Pousser les limites du « discutable » en tant que journaliste à Singapour peut mener à une perte d’emploi, à des poursuites en diffamation, mais aussi (et le plus souvent), à rien du tout. Que l’application de ces sanctions ne soit pas systématique rend le phénomène difficile à cerner et explique en partie l’existence d’une diversité des points de vue sur le sujet. Pour certains journalistes interviewés, l’idée que les médias singapouriens ne soient que de vulgaires haut-parleurs gouvernementaux en est une absurde, alors que pour d’autres, elle incarne une réalité bien tangible. J’ai pu identifier quelques facteurs semblant influencer la nature des réponses de mes interlocuteurs. L’âge, le niveau d’expérience, et surtout, l’entreprise médiatique pour laquelle oeuvre le journaliste sont tous des éléments pouvant façonner sa façon de voir. Les médias traditionnels les plus lus ont tendance à faire l’objet de davantage de contrôle gouvernemental, ce qui teinte l’opinion des professionnels y travaillant. Les médias s’apparentant à des tabloïds, quant à eux, jouissent d’une plus grande liberté dont font souvent usage leurs journalistes afin de conduire des enquêtes d’une qualité surprenante. Mais malgré les dissonances entre les témoignages que j’eus la chance de récolter, une chose revenait fréquemment dans les réponses des journalistes singapouriens: la raison d’être des limitations à leur liberté d’expression. Avec des termes extrêmement similaires à ceux employés par le gouvernement, les interviewés ont pratiquement tous tenu bon de me mentionner la logique sous-jacente aux restrictions qui contraint leur travail, et ce, à défaut de nécessairement l’endosser. La logique va comme suit : Singapour est un très petit État, doté de très peu (pour ne pas dire aucune) ressources naturelles. Il s’agit d’un pays composé de trois principaux groupes ethniques, situé dans une région où l’instabilité politique est souvent importante et où les conflits interethniques ont su contribuer à ces climats chancelants. Le tout, sans oublier que la cité-État n’a que 52 ans, et donc, que ses institutions ne possèdent pas encore la solidité normalement présente au sein de pays ayant atteint le même niveau de développement. Dans un tel contexte de « survie », pourquoi encourager l’émergence d’une presse subversive dont la mission est d’agir comme un « chien de garde » prêt à confronter les élus? L’ensemble du pays ne profiterait-il pas davantage de médias ayant pour but de promouvoir et d’expliquer les décisions adoptées, limitant ainsi tout potentiel d’instabilité politique ? La croissance économique massive, pour ne pas dire unique en son genre, qu’expérimenta Singapour durant les dernières décennies n’a fait que renforcer cette logique sous-jacente à la pratique du journalisme au pays. « Pourquoi la presse devrait-elle nuire à la stabilité d’un modèle aussi fonctionnel ? » peuvent maintenant clamer les autorités gouvernementales. Certes, le régime n’est pas parfait, mais peut-on vraiment nommer un mode de gouvernance aux rouages irréprochables? Il est, encore une fois, important de préciser que les journalistes rencontrés ne promeuvent pas nécessairement cette rhétorique. Le constat que je tente ici d’émettre est plutôt que les journalistes ressentirent pratiquement tous, au moment de notre entretien, le besoin de me l’expliquer. Être confrontés aux questions d’une étrangère les incita à réitérer qu’une raison valable (ou du moins rationnelle) justifie que les autorités limitent leur travail. « Tu dois comprendre que Singapour est un pays jeune et de très petite taille » débutaient-ils souvent. La tendance des interviewés à me répéter que Singapour n’est pas l’équivalent de la Chine ou de la Corée du Nord en matière de censure, mariée aux constats susmentionnés, me confirme que l’identité du chercheur risque d’influencer la nature des réponses des intervenants. Ces derniers auraient-ils tenu bon de me rappeler ces points si j’avais été originaire de la région ? S’agissait-il d’une réaction défensive découlant d’une fatigue de se faire dépeindre comme de simples victimes par la plupart des observateurs étrangers ? Bien que je ne pourrai jamais vraiment répondre à ces questions, garder cette possibilité en tête sera important tout au long de l’analyse de mes données de terrain. Anne Gabrielle Ducharme is a Master’s student in Political Science at McGill University. A call for the evening prayer ends and it is just after 6 pm. The sun is still out, but getting ready to set. It’s a nice evening after sporadic rainfalls throughout the day that have cleared the polluted Jakarta air. I put on sandals and walk out of my boarding house to go to visit Ibu Dewi’s food stand. By Jakarta, Indonesian or international standards, I am not sure if I would call Ibu Dewi’s family poor or middle class. Ibu Dewi does laundry for everyone in the house on top of cooking and cleaning for her own family, and her husband occasionally works as a driver and fixes things around the house. They “own” the house and though they do not have papers to prove it, everyone in the neighbourhood treats them as such. While car ownership is ubiquitous in Jakarta these days, they do not have a car but my friend lets them drive his when needed. I often thought their affluence is defined, not by their own but by their collective wealth in terms of the resources they have access to in the community. They have two daughters, but I know when I go visit her today, only one of her daughters will greet me. The older daughter died last year of aplastic anemia. I remember her well. She was getting top marks at school and spoke good English. She was a dutiful daughter too. Her parents could rely on her to do her part around the house. Her younger sister looked up to her. The boys in the house—mostly unmarried single guys working in retail jobs—treated her like a sister. Everyone had dreams and hopes for this bright young girl. Aplastic anemia, if untreated, has a very low rate of survival. She died in a matter of days after being diagnosed. The entire house mourned. My friend was not himself for weeks. I have witnessed a lot of deaths in my friends’ friends and families in Indonesia, and have come to understand that unlike in North America, death is not necessarily part of a feared, avoided vocabulary. It registers as a reality because it happens so often, perhaps because of the quality of medical care or just the sheer size of the population. But the ripple from the young girl’s death lasted longer and went deeper. When I found out Ibu Dewi started a food stand just outside her house, I immediately wondered where she could have set it up. From what I remember, a compact car could barely pass through the street in front of her house. I also could not think of a wide enough spot anywhere on that street to erect wooden pillars to put up plastic sheets. Nonetheless, Jakarta has a cheeky way of defying all predictions: when I arrived at her house a couple of days ago, Ibu Dewi greeted me with a big smile inside the small warung (food stand). Magically, there was enough space for her to set up a wok, a gas stove, a glass display case, and a bench for her customers—mostly neighbours—to sit. My friend’s car, wrapped in a silver plastic cover, served as a back support for the customers sitting on the bench. While I nibble on my two favourites, mendoan and tapai*, Ibu Dewi gingerly prepares another batch to fry, and waves at her husband who is reclining on a motorcycle in the street and talking to the guys who stop by for a chat. Ibu Dewi tells her husband to bring out some plates from the kitchen that all of us can see from where we are. The street, people, houses, stray cats and motorcycles… There are no boundaries here. The space seems to have opened up for more experimental formulation of new spaces. The sensations and sounds make me feel dizzy but happy. Ibu Dewi looks at me eating happily, and says, “Do you remember my older daughter?” I lift my eyes from the plate with my mouth full, coated with warm grease on the inside. I don’t know how to respond to her. Of course, I do. She’s not here and that makes me remember her even more. “Yes, Ibu, I remember.” “You know, she has visited my younger daughter in her dreams. She has asked her how we are.” She pauses as batter-covered bananas float in the pool of heated oil. She moves them around a bit. Everyone around us seems to be moving around too. The sounds of motorcycles blaring, someone bursting into a song, and laughter of the neighbours compensate for my silence. Ibu Dewi says, “But she has not come to mine.” I feel a lump in my throat, but cannot think of what to say. Should I suggest a possibility that she might see her daughter again? How does one console a parent who lost a child? Moments later, another customer walks in and interrupts our conversation. Ibu Dewi, a naturally smiling woman, cheerfully tells him what’s available. A motorcycle drives by us, miraculously finding a path in the narrow street filled with people. In Google Maps, this street does not exist anyway. My friend returns from work and says hi. Ibu Dewi’s husband spots me in the bench and asks if I want something to drink. Another friend sees me with a plate of food—that I am still holding—and joins me with his own. Just like that, the moment of sadness flows away. Before any of us realized, the sun has set and the night has fallen. A Jakarta night has just begun. +Ibu: Meaning mother. A common honorific referring to older women. *Mendoan is a thin tempe, fermented Indonesian tofu. Tapai refers to a fermented food and hers is made from cassava. Note: Names of the individuals who appear in the story have been changed. Kilim Park is a PhD candidate in Interdisciplinary Studies at the University of British Columbia. Dr. Penny Van Esterik is Professor Emerita in the Department of Anthropology at York University. Dr. Van Esterik is an anthropologist of Southeast Asia and her research interests include nutritional anthropology, gender and development, and advocacy anthropology. She has written on infant feeding, food symbolism, Theravada Buddhism, Southeast Asian refugees and material culture. For this edition of CCSEAS In Time, we sat down with Dr. Van Esterik to look back on her career and research, and to hear about her reflection on CCSEAS. Q: Tell us about yourself and your research and how you became interested in Southeast Asia. A: My first exposure to Southeast Asian studies was a course on the region taught by Shuichi Nagata at the University of Toronto. Shuichi and Judith Nagata (York University) studied at the University of Illinois, and later Shuichi helped my husband and I to study there as well. At the University of Toronto in the 1960s, I was involved in a lot of protests around the Vietnam War and became very interested in Vietnam and Southeast Asia. After Shuichi’s course, we both decided that was where we wanted to study. The week after we graduated (BA for me, MA for John), we were married and a few weeks later we joined CUSO (Canadian University Services Overseas). We were originally going to be assigned to the Hill Tribe Research Center in Northern Thailand, but we didn’t get that assignment. Instead, we were each assigned to help universities in Bangkok develop anthropology programs and ethnographic research in rural Thailand. The experience confirmed that we wanted to do our PhD research in Thailand. But in 1969, there was really no place you could go in Canada for Southeast Asian research in anthropology. With Shuichi’s recommendation, we went to the University of Illinois to study with Kris Lehman, who worked on Burma [Myanmar], and Clark Cunningham, who worked on Indonesia and Thailand. We focused primarily on mainland Southeast Asia, but studied the whole region. Q: What was so interesting about Shuichi’s class that just drew you? A: Part of it was realizing how little I knew about the region — the frustration of seeing so much in the headlines about the region but having no interpretive context. At that time, I was trying to balance archaeology and cultural anthropology, and had a strong interest in cultural history and a fascination with Indianized state systems like Angkor Wat. Once we spent time in Thailand, we gained some expertise in Theravada Buddhism and village ethnography. All this fed into the growing interest I have always had in cultural history with a broad regional perspective. Shuichi Nagata and Kris Lehman knew the Dutch and French literature well, and that provided me with a deeper understanding of regional cultural history. Q: What was the topic of your PhD dissertation? A: Well, that’s a long story. We did ethnographic work in villages in Thailand, doing research around religion and village life. With a summer grant to spend a few months in Thailand before we wrote our proposals, I came across some beautiful painted pottery that I had never seen before in antique shops in Bangkok. At that time, there was a very unusual site being excavated called Ban Chiang in Northeast Thailand. Its beautiful painted pottery was rapidly being looted. The American military had air bases close by and the looters began to dig up the pottery and sell it to the Americans who would fly it home and sell it for a fortune. I became very interested in the tradition because I knew there were few painted pottery traditions in Southeast Asia other than in the Philippines and Southern Vietnam. I wrote a proposal to study Ban Chiang painted pottery, the looting of the sites and how people were faking the pottery. That became my thesis: Cognition and Design Production in Ban Chiang Painted Pottery. Since I have retired, I am considering re-examining the material from the looted collections, partly to rethink some of the theoretical problems around authenticity and design production, and partly to provide a record for others to use. I have not worked out the ethical implications of identifying the looters after 50 years. And I need a younger collaborator since my eyes and technical skills on the computer are not sufficient to the task. Q: Where did your research take you next? A: I always kept a broad interest in the region and also worked on gender and religion. When I couldn’t get a job focused on cultural history and archaeology, I began to look for a focus that was significant for people in Southeast Asia, had a historical aspect, gender aspect, symbolic aspect, and applied aspect. Around that time, there was a new field beginning to emerge from medical anthropology — nutritional anthropology. I began to shift my focus to food. You can examine food historically through archaeological work, and also through religion or gender. I began to write about gender and food, religion and food, and retrained myself through my association with Cornell’s International Nutrition program. I felt very strongly that food was central to gender identity and ethnic identity in Southeast Asia. So it wasn’t as if I was working on something Southeast Asians didn’t care about. Everywhere in Southeast Asia people want to talk about food! Food is one important way to understand reciprocity, power and sustainability. If you don’t understand food in Southeast Asia, you don’t understand the region. Food studies provided a way to bridge different areas of my training and in a lot of ways, it also unites the region. Historically, you find wet rice cultures impinging on more marginal root crop areas and on dry rice swiddens in the uplands. Through food systems, you can look at how power relations change through history. Q: The field of academic studies on Southeast Asia is changing: the emphases, the idea of area studies, and the disciplines… What are your thoughts on these changes? A: I’m an old-fashioned, four-field anthropology person, very much out of fashion now but re-emerging through the concept of integrative anthropology. I see the importance of broad synthetic approaches to things. I’m glad I had some training in archeology and cultural history as they shape contemporary processes. One of the biggest changes is the lack of respect and resources for area studies. In the past, students could take a major or a minor in area studies along with a discipline. You would be able to pull together many different themes and patterns across the region. I think that training helped develop valuable comparative perspectives in the region. Somehow we need to rethink area studies to meet the needs of the modern university curriculum. Area studies is particularly challenging in Southeast Asia because of its complex colonial histories, with states that claim to be uncolonized, surrounded by states under colonial control by the French, Dutch, British, Spanish and Americans — each having powerful but unique impacts on societies. You also have many unrelated languages combined with a long history of land and maritime trade. Globalization is not a new process in Southeast Asia, but you need a long time frame to understand the processes. Q: Let’s talk about CCSEAS. When and how did you get involved? What do you remember about CCSEAS? A: My husband and I studied at the University of Toronto, and then we disappeared for two years in Thailand with CUSO (1967-1969) followed by doctoral work at an American school. CCSEAS was the only way we kept connected to what was happening in Southeast Asian studies in Canada. We always tried to come up for the meetings, particularly if there were funds to subsidize student travel. By chance, we were at one of the first planning meetings in the early 1970s when people interested in Southeast Asia saw the need for an association. The meetings were great opportunities for social networking. We had made a decision to get our PhDs at an American school, and our education was very different from our colleagues who were getting their PhDs in Canada or Britain. In Illinois, there were many students doing dissertations on Thailand. When we came home to Canada, there were few people working in Thailand. But with CCSEAS, it didn’t really matter because conference panels were often put together across the region. We could be on panels with students who had done work on Vietnam and the Philippines. That was an important perspective that we were missing in Illinois. When we attended large meetings such as the Association of Asian Studies, we would only attend Thai or Lao sessions. But with CCSEAS, we always thought regionally. CCSEAS attracted many strong women academics who made sure gender issues were front and centre and who called out even senior academics who were occasionally gender blind. It was a comfortable place for a young woman starting out in the academic world. CCSEAS never ghettoized students. Students were always a part of panels. They learned the idiosyncrasies of presentations in a friendly atmosphere. To give you an example, everybody knew everybody but we gossiped non-stop! So there were some academics who would never stop talking. The students knew and talked about it. You would have to figure out how to set up a panel so that the person who never stopped talking was the last speaker because if this talkative person was the first speaker, the students never had time to present. Quite informally, we students learned how to get on the panel where we would have the best chance of getting our 15 minutes! Around 1980, expertise on mainland Southeast Asia was in demand because of the Southeast Asian refugees coming from Vietnam, Laos and Cambodia. Our knowledge was valuable and practical. We provided orientations in churches to explain, “No, they are not Tibetan Buddhists.” We would talk about religion, kinship and food, the importance of reading emotion on faces – all these things we had learned while doing fieldwork in Southeast Asia. Over a three-month period, CCSEAS and CASA (Canadian Asian Studies Association) put together a book about Southeast Asian refugees, explaining how the wars developed, the refugee’s stories, and why people from Southeast Asia were settling in Canada. That was the beginning of CCSEAS’ focus on migration and diasporic communities in Canada. Q: At the height of CCSEAS, how many members were there? A: I honestly couldn’t say. I was the president in the year that the CCSEAS president became the CASA president as well (1994). We organized several conferences at York University where we could always have two to three concurrent sessions, with four papers per session. Most of the people attending were presenters, with the addition of students getting a feel for the field. You knew everybody, which was a significant advantage. Occasionally, there was generous external funding and we had two CCSEAS meetings in Southeast Asia, one in Singapore and one in Bogor, Java. We were matched with Southeast Asian studies from all over the region. That was just such a rich, significant experience. Q: What do you think is Canadian about CCSEAS? A: It could be just the matter of demographics. CCSEAS provided a smaller, more intimate setting. People worked with Canadian approaches to globalization and immigration. It was a way to link graduate students who were in Canadian graduate schools. At CCSEAS meetings, we always ate well, we always danced, and often the males built pyramids (depending on the amount of beer consumed during our meeting). I think Geoff Hainsworth was always at the bottom, and Terry McGee somewhere in the middle. The lightest male at the meetings was expected to climb to the top. The guys with the widest shoulders were at the base. I am conveniently repressing the memory of whether they tried to put one of the women on top. I do remember that we tried it in Bogor, and it might have been during Ramadan. We were being rambunctious and told to behave ourselves. Q: Can you tell us about your new book? A: It is called Dance of Nurture: Negotiating Infant Feeding (Berghahn Books, 2017, with Richard O’Connor). As I mentioned, I had moved into food studies, but I always kept my advocacy work very separate from my academic work. I was one of the founders of the Nestle Boycott, and I did a lot of writing on what the formula companies were doing in Southeast Asia to undercut breastfeeding. I found that breastfeeding and child nurture were highly valued in the region, but through modernization and globalization, formula companies began to view the region as a huge new market for commercial baby food. I was very active in that movement. The advocacy work was appreciated in some quarters and not in others. Much of my work was with local NGOs and groups like UNICEF. I began to ask how this problem links up with food security more generally in the region and out of that came the experience of moving between international agencies, national governments and local communities. I then began to build this idea that Southeast Asia had a distinct approach to nurture. In other words, the power of women to nurture others was respected in Southeast Asia, I think, more than it was in some other areas. In Southeast Asia, a woman who nurtures well is respected; Barbara Andaya’s work on the Javanese flaming womb stresses the complementarity of feminine power and masculine power in the region. To nurture is the capacity to make something grow and become strong by the provision of food and care. Whether it was orchids, rice or babies, that power was not denigrated. “Mother rice” was powerful! And then you have these western forces coming in trying to undermine that. My middle chapter in the book, “Customizing Nurture in Southeast Asia,” looks at ethnographic work in Southeast Asia around breastfeeding and food provisioning for children. Southeast Asian concepts of nurture informed the book, particularly my critique of modernization and globalization. The logic of feminine power in Southeast Asia structured the book and the way I thought about the power of nurture. I don’t quite know where the dance metaphor came from – perhaps from CCSEAS? I was thinking about how dance, textiles, performative art and food are critically important for gender identity and ethnic identity expressed through these means. So I began to think of dance as a suitable metaphor for nurture. In North America, nurture is easily represented by war metaphors – mother versus baby. Women are asked how are you going to work and be a good mother? Will you provide home-cooked meals or use processed food? Southeast Asia challenges dualities like public vs. private. If you are a food vendor in Southeast Asia, food starts from a kitchen and it goes to the streets. What doesn’t get sold on the streets goes back to the home. There’s much more fluidity to the movement of food. So the book is really a critique of some of those Cartesian ways of thinking. Southeast Asia taught me about the importance and strength of household and hearth. I wouldn’t call this book a Southeast Asia book, but in a lot of ways, it was inspired by my work in Southeast Asia. Q: How would you like to see CCSEAS develop in the future? A: It would be great if CCSEAS could facilitate more language training. If you don’t have structures in place to support good language training and culture history, then you’re only going to do technical studies. You can begin narrowly as you have to for a PhD, but with an eye for the potential and the importance of comparison within the region. I don’t think this is a popular viewpoint or one that is considered up-to-date in universities today. It could be a reflection of my age, or the fact that I’m not teaching now. But I’ve seen the funding disappear for language studies, and because of that, students get more specialized sooner into a narrower disciplinary focus. But you can’t explore migration without looking at history, culture, gender or geography. You need to develop synthetic approaches, and language and culture training helps you get them. Q: What is your advice to today’s graduate students? A: My advice might be of some use to graduate students who were already thinking along these lines. I do not recall receiving any useful, relevant advice from my senior academic mentors, but perhaps that is selective memory. This interview has been edited for clarity and length. Our thanks to Dr. Penny Van Esterik for taking the time to meet with us while on a short visit to Vancouver. We are grateful for her generosity and enthusiasm shown throughout the interview. What makes a survivor? How do we classify what has been done to others during times of trauma and conflict? As my partner and I explored Cambodia seeking out people gracious enough to share their stories, I found myself asking these questions. We came as filmmakers to Southeast Asia because we were looking for personal narratives that were outside of our own experience. We have always been fascinated by culture, constantly seeking out places that are vastly different from our own. This act of discovery is a big part of our connection, and of our life together. Photo by Surviving Bokator Inc. Upon entering Cambodia, the country quickly struck me as a place teeming with untold stories. From 1975, the brutal Khmer Rouge regime came to power with enforced ‘social engineering’ policies throughout the country. This led to widespread famine and disease as well as the carrying out of arbitrary executions and mass torture. An estimated 2.5 million people lost their lives during the genocide, which ended with the Cambodian-Vietnamese war in 1979. Today, the Khmer people are slowly overcoming the shame of the Killing Fields and regaining the pride of their noble ancestors. Cultural reconciliation was a constant narrative running through every conversation we had. Loss of family, dreams for the future, a new hope, and a new way of being were at the forefront of their lives. From the heart of the pulsing, modern city of Phnom Penh to the provincial countryside where time stood still, on to the majestic ancient temples of Angkor, Cambodia is bursting with vibrant and distinct visual elements. We headed for an orphanage located in the bustling tourist town of Siem Reap. And this is where Bokator found us. Within the orphanage grounds we met a champion fighter who had been hired to teach the children a long forgotten ancient Khmer martial art. 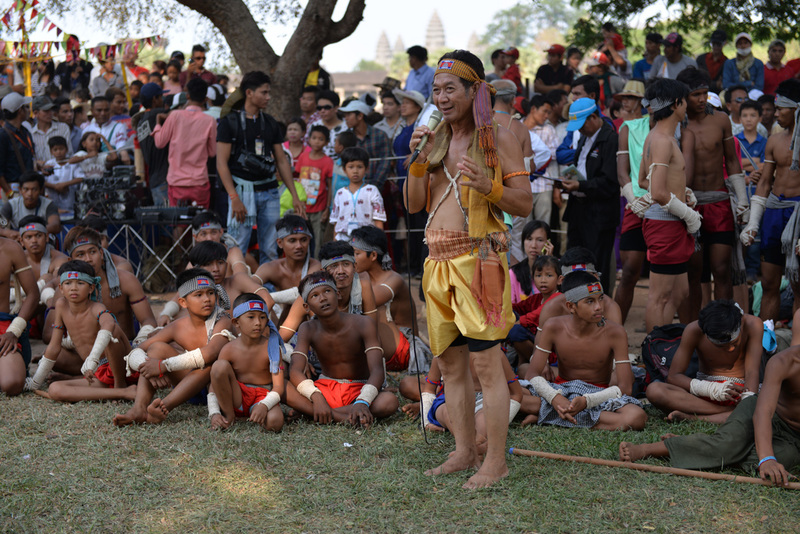 Bokator, one of the oldest martial arts in South Asia, was the close-combat fighting style of the ancient Khmer empire. Its techniques can still be found carved into the walls of the majestic temples of Angkor Wat, built over 1,100 years ago. For generations, Bokator remained a symbol of Cambodia’s strength and pride. Then the fanatical Khmer Rouge came to power and Bokator martial arts masters were systematically exterminated for fear of a revolution. Those who managed to escape, fled and hid, guarding their secrets closely. I wanted to pursue the path of this long-forgotten art. I didn’t realize at the time how grand the themes would come to be, the ideas of cultural revival, intergenerational trauma, and how a country can recoup from war. These motifs would only emerge later as we began to draw connections between all of the engaging characters we would come to know and love. How does a genocide survivor reinvent himself? Our journey led us to the source of Bokator’s revival, Grandmaster San Kim Sean, a man of great charisma. Having fled Cambodia, where he witnessed the death of his two children in the genocide, he had endured a refugee camp in Thailand before immigrating to the United States. There he struggled with many odd jobs before opening a martial arts gym in California. Two decades later, upon learning that Bokator was no longer practiced in his homeland, he made the life decision to return to Cambodia and restore his people’s lost heritage. I first met with Grandmaster in his sparse, leaky Bokator Academy ruminating over a parking garage in the heart of Phnom Penh’s Orussey Market. An hour into our discussion I knew that I needed to start filming. He was everything you would want in a hero — staunchly charismatic, headstrong and ready to abandon all in order to revive this ancient sport. Despite his external charisma and showmanship, it was very clear to me that Grandmaster had a protective side to him. Like many of the countrymen of his generation, he was suspicious of those around him, especially those with influence. He struggled for power in his relationships — perhaps a way to control any given situation after so many years of broken trust and profound loss. The layers of trauma are often imprinted upon us. Grandmaster didn’t want me to see the dark side of him, expressed by fits of anger. He would check to see if the camera was off when things became intense. However, in time, the consistency of my presence helped to break down his defenses. I saw more dimensions to this intriguing man, particularly rooted within the conflict in his relationships. I didn’t know what the source of his anger was — he was unpredictable. At times, the gym felt like a pressure cooker, with both master and student navigating this complex web of emotions. I spent five years with this passionate teacher and his students. On my last visit in 2015 I chose to sit down with the students of grandmaster. The younger generation revealed to me that their parents never speak about the past. They admitted that their parents were distrusting of outsiders, often to their own detriment. This was perhaps the greatest divide I witnessed during my explorations in Cambodia. The genocide generation who still limps forward with the trauma of a horrific past, and a younger, unblemished generation who are forging a bright, new future for themselves and the country. Between these two generations lies the struggle on how best to move forward and who should take the lead. It is a theme we see time and again in countries affected by conflict. My experiences in Cambodia still resonate with me today. On our first visit to Phnom Penh, there was a Khmer film playing on the bus. It was a comedy, Laurel and Hardy- style. Cambodians are brilliant at slapstick. I was laughing. I couldn’t understand what was being said but it was silly and gave me a full-bellied laughter that I hadn’t felt in a while. I looked around to see that the whole bus was laughing. To enjoy the gift of laughter en masse, without any filters — it’s kind of what brings us together. Let’s all laugh together, let’s all cry together. This rawness, this vulnerability of human emotion. As a filmmaker, it’s what I live for. My documentary film ‘Surviving Bokator’ is not just about a country recovering from genocide. It is about the strength of the human spirit. It is about transcending adversity on behalf of a national identity, at the risk of the self and the ego. Today, Bokator, in particular, has become a metaphor for Cambodia’s renewed cultural empowerment. My wish is for this film to pose a view into the microcosm of the future, what happens to countries that survive conflict, and how they can recoup the things they have lost. Mark Bochsler is a Canadian filmmaker. To learn more about Mark’s film, visit www.survivingbokator.com. If businesses can understand trade trends and future challenges in the ASEAN Economic Community, they can operate efficiently and effectively throughout the global value chain. But cross-border commercial and business operations can be complex, and this requires a thorough understanding of challenges and opportunities. The International Development Research Centre (IDRC) and the National University of Singapore (NUS) are offering fellowships for Southeast Asian entrepreneurs, leaders in business, government, and civil society who want to better understand Southeast Asian value chains. The four-day program will give participants a useful toolkit of ideas to take full advantage of a connected ASEAN Economic Community. Eligibility: Anyone from ASEAN member countries and Timor-Leste can apply for a fellowship grant to attend. Women leaders from Cambodia, Indonesia, Laos, Malaysia, Myanmar, the Philippines, Thailand, Timor-Leste, and Vietnam are especially encouraged to apply for the discretionary scholarships and grants. Participants are strongly advised to apply at least two months in advance. Applications received after the deadline will be considered based on space availability. Read the announcement from IDRC. Global Affairs Canada has announced that Canada will provide CAD 10 million over five years for post-secondary students and mid-career professionals from Southeast Asia to access education in Canada. The Scholarships and Educational Exchanges for Development (SEED) initiative will provide individuals from ASEAN member states, especially women, the opportunity to apply for short-term studies or research in Canada. Scholarships will be awarded in fields that contribute to ASEAN’s efforts to narrow the development gap and reduce poverty in Southeast Asia, such as climate-smart agriculture, renewable energy, public financial management, and sexual and reproductive health and rights of women and girls. Canada has signalled its intention to comprehensively re-engage the Asia-Pacific region and reclaim its own position as a Pacific nation. Southeast Asia is a vital part of this strategy. As Canada and ASEAN celebrate 40 years of dialogue partnership, which coincides with the golden jubilee of the grouping itself, there is growing momentum to bring the relationship to the next level. Against this backdrop, Global Affairs Canada held a conference entitled Southeast Asia in an Evolving Global Landscape: Prospects for an Integrated Region and Implications for Canada in Ottawa on May 30, 2017, marking an important next step in this direction. This high-profile event brought together a total of 200 participants, including ambassadors and diplomats from ASEAN member states, leading Canadian and international scholars on Southeast Asia, and representatives from Global Affairs and the broader government community. Punctuated by remarks from The Honourable Chrystia Freeland (Minister of Foreign Affairs), H.E. Le Luong Minh (Secretary-General of ASEAN), and Canada’s 16th Prime Minister, The Right Honourable Joe Clark, discussions during this day-long event covered major issues in Canada-ASEAN relations, from geopolitics to security challenges and economic opportunities. From these stimulating exchanges emerged a set of innovative, yet realistic recommendations on how Canada could better assert its added-value in this strategic region, where a number of major players already vie for attention. An edited volume from the conference will be launched during the Canadian Council for Southeast Asian Studies’ Conference on October 26-28, 2017. The volume brings together contributions from the panelists, giving them the opportunity to render and further develop their assessments and recommendations. In the process, they lend important support to Canada’s endeavour to develop a sound and effective foreign policy towards Southeast Asia, one that builds on its previous, well-remembered contributions to regional peace and prosperity, but goes beyond earlier engagements. The volume also identifies what its partners could gain from Canada “being back” in the regional sphere. Edited by Stéphanie Martel and Nhu Truong. With contributions from Kai Ostwald, Brian Harding, Christopher Goscha, Mairead Lavery, Deborah Helms, Elina Noor, Lindsey W. Ford, Sidney Jones, Jonathan Berkshire Miller, and Paul Evans. We believe this edition of CCSEAS Newsletter embodies the spirit of the community of scholars, students, and activists who feel motivated by and passionate about Southeast Asia. Their desire to share Southeast Asia with Canada, influenced by personal and unique encounters and experiences, comes through in the pieces published in the Fall 2017 edition. We are grateful to all contributors who have worked with us patiently throughout the editing process, and feel energized by the field reports that take us back to the region and the memories that allow us to imagine the CCSEAS back in time. We’d like to thank Abidin Kusno for always being there for us with his timely advice and astute guidance. Without Jean-François Rancourt’s editorial support and Irene Poetranto’s technical expertise, we would not have been able to complete this edition. We also want to thank Alicia Filipowich for her continuing support for the Newsletter and attention to detail. Lastly, we thank everyone on the CCSEAS Committee for their encouragement and support. As we hand over the task of knitting together CCSEAS Newsletter to the next pair of co-editors, we hope that the Newsletter will continue to be a forum open to students, faculty, and community members of CCSEAS and all those interested in the study of Southeast Asia.